Last year, I wrote a summary of 2012 and already another year has flown by. January began with a visit to see the floods in Henley on New Year’s Day, followed by tea in the evening at mum’s. Later in the month, we had some snow on the same day that I’d booked the car in for its first MOT. Fortunately I managed to nurse it home later. The girls also enjoyed making a snowman – with a little help! As January turned to February the snow disappeared and we enjoyed another good night at our Annual Church Meal. I was also able to start making inroads on a new season in the veg plot, with some preliminary digging and we found time to visit Cliveden with some of the wider family for a late winter walk. As February ended, I finally got around to having my birthday meal, held over from December, at our favourite Chinese restaurant. The occasion coincided with Alan’s birthday and, as usual, he was on good form! In March Rebekah celebrated Red Nose Day by going to school as a penguin! Rebekah the Red Nose Day penguin! We also managed a visit to see Auntie Myrtle – and I even remembered to take my camera! The slow and chilly start to spring continued, with a flurry of snow arriving on 23 March! As March turned to April, the cold showed no signs of abating. We duly donned our winter coats for a chilly visit to Greys Court with mum and Heather’s family. April was also the month when Sarah’s sister, Nicky, tied the knot with Mark. A few days later, the weather eventually began to warm up and we enjoyed a walk in the woods close to Cliveden. Once the sun came out, we were even able to take off our winter coats! The death of Baroness Thatcher was announced in the afternoon of 8 April. I captured some tweets from the day. 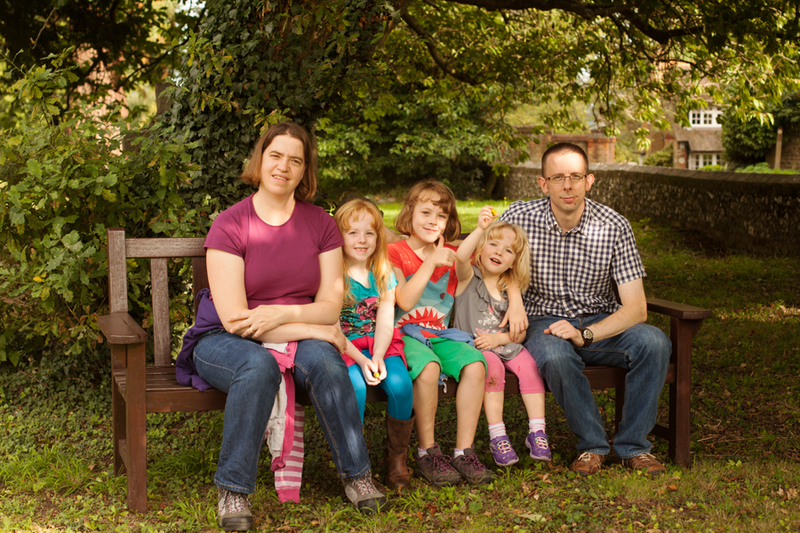 Later in the month, we surprised the girls with an overnight stay in Bournemouth. Although it stayed dry during our visit, there was still a chill in the air. Having just been down to Bournemouth, we decided not to venture too far for Sarah’s birthday and ended up spending the afternoon at Cliveden. At the end of the month, we took Sarah’s parents up to see the Lambing Weekend at Berkshire College of Agriculture. Eventually, April turned to May and we paid a visit to Ray Mill Island to enjoy the warmer temperatures and the first ice cream of the year. With a rare sunny Bank Holiday Monday in May, we took mum up to Cliveden again, to enjoy the spring flowers. It turned out to be a record breaking day for them, with almost 7,500 visitors! The next day, with warm sunshine still lingering, we took Emily for a walk at Braywick Nature Park. Emily and a giant dragonfly! Later in the month, we also visited Carters Steam Fair and did more planting in the veg plot. After standing empty since my grandmother’s death in December 2010, her old house in Cookham Road, Maidenhead, was finally torn down to make way for flats. The destruction triggered a few memories of the old place and its much loved owners. At the end of May, we had enjoyed the sunshine during an afternoon at The Vyne. Summer finally arrived and brought with it the sad and sudden passing of Sarah’s nan. Her funeral took place on 17 June. A few days after the funeral, we celebrated mum’s birthday with a meal at the Bird in Hand. We also managed to fit in more work in the vegetable plot as well as going to Holly’s Sports Day. We had a busy final Saturday in June and managed to shoehorn in a visit to the school fair, an open day at Sarah’s old school, a party for Holly and an unexpected bbq in the evening. In July we had an excellent visit to Lacock Abbey. This culminated in tea in the garden at my brother’s house. A few days later, Andy Murray became the first British men’s winner of Wimbledon since Fred Perry’s victory in 1936. I captured the reaction on Twitter. Also in July, Sarah and I went along to our former school’s 50th anniversary celebrations. Later in the month, Rebekah celebrated her 9th birthday. The following day, it was Emily’s turn. She turned 3 and was excited by her Peppa Pig birthday cake. In the afternoon of the same day, we also saw the Swan Uppers as they passed through Maidenhead for their annual count of the swans on the Thames. Also in July, the Duchess of Cornwall gave birth to her son. Prince George arrived on 22 July at 4:24pm. I recorded events on Twitter during the day. The next day they left the hospital with Prince George. As summer passed, July turned to August and it was time to harvest the potatoes from the veg plot. The following day we went over to Windsor to see the Jubilee Fountain which had opened last year. Given the heat of the day, the girls ended up a little damp! We also enjoyed an afternoon on Ray Mill Island as well as spending time up at Cliveden, seeing the new slide in place to help ‘save the south terrace’. At the end of August we enjoyed a brilliant week away in south Wales, staying at Burry Port. In early September, before the schools went back, we took the girls over to the Savill Gardens to enjoy a cycle ride. Just a few days later, it was time for the girls to go back to school. Rebekah started Year 5, while Holly began Year 2. A couple of days later, it was time for Emily to begin her time at Nursery. Later in the month, it was the turn of my nephew, Hugh, to head off to university for the first time. We met up for afternoon tea at Dorney Court to bid him farewell. At the end of September, we went over to Holyport for the return visit of Carters Steam Fair. October brought one of the highlights of the year, as Uncle Den celebrated his 90th birthday. Later in the month, a deep depression swept across southern England, bringing heavy rain and strong winds. I recorded how the storm developed on Twitter. We enjoyed a trip down to Littlehampton during the autumn half term and the following day we took mum over to Bourton-on-the-Water. As October became November, the girls made the most of the fallen leaves on Ray Mill Island. On the day before Holly’s birthday, we went to Windsor and Rebekah and Holly enjoyed ‘bungy’ jumping. The following day, Holly celebrated her 7th birthday. With another Ashes cricket encounter underway, Twitter reacted to the start. The death of Nelson Mandela was announced on 5 December. I recorded Twitter’s response. Later in the month, we took the girls to Hughenden Manor to see the house transformed for Christmas. Holly later starred as a Wise Man in her school Christmas performance. After the usual weeks of build up, Christmas finally arrived. We celebrated with lunch at home and tea at my sister’s. On Boxing Day, we enjoyed tea at mum’s house. The year ended as it had begun, with more high water at Henley. The traditional Bray family gathering took place in the days after Christmas, with seventeen enjoying tea at Heather’s house. So, 2013 drew to a close. Once again, it had been a busy year, which also included our monthly walks to Cookham Dean. As we go into 2014, we have much to be thankful for and much to look forward to.